if they're really out to get you. In James Risen's book "State of War : The Secret History of the C.I.A. 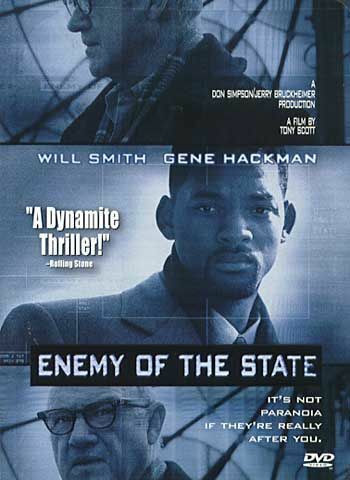 and the Bush Administration," He talks about this movie Enemy of the State and how Hayden had seen it just before coming into the job at the NSA and has since tried to manage the NSA's PR problem - the paranoia that this movie and other tales left on some people. It's just interesting to see it come up again. I have been meaning to find this movie and watch it since I read his book, but haven't gotten around to it. Excellent book, by the way. Anyone seen this movie? any thoughts on it? Yeah, I liked it. Hackman was Hackman, Smith was Smith, and the whole thing was pretty Hollywood, but well done. The Bad Guys were presented as rogue elements, of course, but otherwise a pretty good primer on exactly what we have been on about. I haven't read Risen's book. It sounds like Hayden is a true Bushie -- manage perception and do whatever evil you want behind the scenes. If you wait until you have a REASON to be paranoid, you've already lost. The only functional use of paranoia is to get you well clear of any problems BEFORE they actually appear. Of course, the trick is not to waste energy avoiding problems that don't exist. <-<--esoder<---<----<----, it's simple. KEEP moving. It makes it harder for them to aim. It ain't a diaspora if you outsmart them.